If the lot does not pass the perc test, some municipalities may allow you to build an alternative engineered system. Alternative systems may also be required on waterfront properties and other environmentally sensitive areas to help protect water sources. Where the problem is soil that is too dense, too shallow over bedrock or hardpan, or the water table is too high, a “mound” system is often the first choice as it works much the same as a standard system, only with the leach field raised above the natural grade. Alternative systems cost more because they have more moving parts and electrical components (pumps, monitors, alarms) and greater complexity. They require greater monitoring and maintenance to prevent problems. They also require expert design and installation. If either the designer or the installer is unfamiliar with the technology being used, it may not perform as intended. There is no one-size-fits-all solution. Design of a system is specific to the soil type, site conditions, and usage levels. Make sure your designer and installer both have proven track records with the specific system you are using. Some states and municipalities only accept system types certified in their jurisdiction and may require that the owner maintain a service contract with an approved vendor. Proper maintenance is critical for success with alternative systems. The mound uses a series of small distribution pipes set in a layer of gravel on top of a layer of sand, typically one to two feet deep. The tops and sides are covered with topsoil (see illustration). A mound system has one extra component, a dosing chamber (also called a pump chamber), which collects wastewater coming out of the septic tank. Using a pump and a float system, the dosing chamber pumps effluent at a controlled rate for uniform distribution into the leach field. Most have an alarm system that alerts the owner, or maintenance company, if the pump fails or the water rises too high in the tank. Observation tubes are also recommended which allow easy inspection of the tank without digging up the access port. Also monitoring wells are often installed to monitor the conditions in and around the leach field. 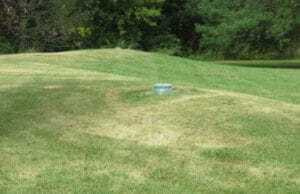 The telltale shape of a mound system is a familiar sight in areas with heavy clay soil. The biggest costs are the additional equipment as well as the earthwork and extra materials needed to build the mound. Depending on the system design and the local cost of sand and gravel, a mound system can add $10,000 or more to the price of a conventional system – often costing over $20,000 in some areas. Also, mound systems require more frequent pumping and more monitoring and maintenance because of the added complexity. Annual maintenance costs can be as high as $500. Bottomless sand filters are common on waterfront sites and other environmentally sensitive areas. There are a wide range of alternative septic systems on the market and new ones arriving all the time. Some are geared more to community systems serving several homes and are usually monitored and maintained professionally by a service company. Some alternative systems are well-suited to individual homes, although the cost, complexity, and maintenance of these systems need to be carefully considered. Most use electric pumps or siphons as well as filters, all of which need more monitoring and maintenance than a traditional system. Pressurized dosing: This uses a holding tank and pump to force the effluent though the distribution piping more evenly and in controlled doses, improving the performance of the leach field. It can be used to rehabilitate a leach field or in combination with other systems such as a mound system, sand filter, plastic leach fields, or drip irrigation. Plastic chamber leach field: This is a standard septic system with an alternative leach field, which may be downsized in some jurisdictions, making it well suited to small building sites. The half-pipe plastic chambers create the void for effluent flow, so no gravel is needed. One example, the Infiltrator System, has been in use for over 20 years, and according to the company can support traffic loads with only 12 inches of compacted cover. The additional cost of the plastic components is partly offset by the savings on gravel and smaller size of the drain field. Sand filter: This is a large sand-filled box, 2-4 ft. deep, with a watertight liner of concrete or PVC. The sand is used to pre-treat effluent, by filtration and aerobic bacteria, before disposal to the leach field. 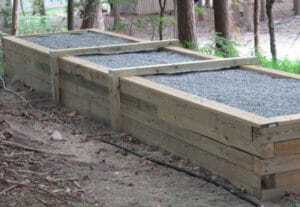 The boxes are usually partially or fully in the ground, but can also be above-grade when required. In the most common configuration, a pump and controls are used to evenly dose the effluent on top of the filter, although gravity distribution is possible in some cases. The treated effluent is collected at the bottom where it is pumped or gravity-fed to the drain field.Some sand filters recirculate the effluent back to the tank several times before distributing it to the drain field. Most sand filters are used for pre-treatment, but they may also be designed as the primary treatment. This is called a “bottomless sand filter” as the effluent passes directly into the soil beneath the filter (see photo above). Sand filters must be well-engineered and constructed, and properly maintained, to avoid frequent clogging of the sand. Read more on Sand Filters. Aerobic treatment system: These systems use an aerobic process to treat the effluent, typically using an multi-chamber concrete tank placed underground. The most complex systems contain four chambers to collect, aerate, purify, and pump the effluent. The first chamber acts like a smaller version of a traditional septic tank. In the second “treatment” tank, an air pump is used to constantly inject air into the effluent. The air supports the growth of aerobic bacteria which process sewage more efficiently than the anaerobic bacteria in a typical septic system. In some systems, a third and fourth chamber are used to further clarification and pump out the purified water. So-called “fixed-film” systems also use a synthetic media filter to enhance the bacterial process. When properly maintained, aerobic systems can produce higher quality wastewater than a traditional system and may include an added disinfectant before the purified wastewater is discharged. Discharge may be to a reduced-size drain field or sprayed over a large area in rural settings. Technically these are mini sewage-treatment plants rather than septic systems, which rely mainly on anaerobic treatment. They are often referred to as ATU’s (aerobic treatment units). These systems are expensive to install and maintain, so are mainly used where high-quality treatment is needed in a limited area or with poor soils. They are becoming more common on waterfront properties. Read more on Aerobic Treatment Systems. Drip distribution/irrigation: This uses a pump to distribute effluent through a filtering device to an array of drip tubes over a large area. The water may used to water a lawn or non-edible plants, which remove the nitrogen from the wastewater. This type of system can be used with shallow soils, clays, and on steep slopes. Because the tubes are near the surface, freezing can be a problem in cold climates. Constructed wetlands. For the ecologically minded who want to play an active role in recycling their wastewater, these can work in almost any type of soil. The system uses a man-made shallow pond, which is lined and filled with rock, tire chippings, or other media. The media provides a habitat for special plants that treat wastewater and provide a pleasant environment. Wastewater from the septic tank is distributed by a perforated pipe across the media bed, where plant roots, bacteria, and other microorganisms break down the pollutants. A second pipe at the back of the wetland collects the treated water. The homeowners must plan to spend time planting, trimming, and weeding the wetlands area. Site Won’t Perc – Can I Use A PUmp-Out Tank? Hello from the coast > I have inherited property that won’t perc but was wondering, why can’t I have a large, maybe 600 to700 gal. above-ground fiberglass, heavy duty tank, for a septic system and have the local honey wagon pump it out once a month. it would be fenced of course w/flowers and shrubbery, ect. ? It’s possible to use a sealed tank in this way, but the local authorities may not give you a building permit without an approved septic system. Also, with an above-ground tank, you would need to pump the sewage into the tank unless the house were uphill from the tank. An alternative septic system might be allowed, but these usually cost 50% to 100% more than a conventional system and also require more frequent pumping and maintenance. If you do decide to store and pump the sewage, you may be able to dispose of the gray water separately to reduce the volume of sewage stored on site. If you’re just planning to use the land for a camper or rustic cabin, you might be OK with a pump-out tank. However, if you are planning to build a house, I would consider the resale value, even if the town allows you to build. Not many people want to pump out their septic tank once or twice a month. According to the USGS, the average US family uses 70-100 gallons of water per day for each person in a household. Even if you cut that in half by using water-conserving fixtures and separate disposal of gray water, you might find that you are pumping out your tank a lot more frequently than you envision. So you might need a much larger tank and can expect to spend $200-$300 each time you pump it. I want to build a small house on my land, which is heavily wooded except for the 25×40 spot where I want the house, and the (narrow) driveway accessing it. I don’t want to cut down any trees if at all possible. Also, the soil is very shallow, with granite less than 3′ below the soil surface, at the most. I would love to use a composting toilet and then just have a system for the graywater, and skip the traditional septic system, but I want to be sure I meet all local codes. Regulations regarding composting toilets vary from state to state, and the city/town/county health department may have its own rules that are more restrictive than the state law. Some states allow composting toilets only if no other system will work. Some allow them as long as you have a conventional septic system for graywater. Some will only let you install a composting toilet if you already have a conventional system approved and in place. With ledge at less than 3 ft. below grade, you would probably need a mound system or other alternative septic system to allow the required clearance to groundwater or impervious soil. Most local jurisdictions will not issue a building permit without the health department first approving your on-site sewage system, so it is important that you get this squared away. The laws can be pretty confusing and local authorities may not be very familiar with these systems. I would start by contacting the building department or health department in your local jurisdiction to find out what is required. Scheduling a face-to-face meeting can be helpful. If you have a specific system in mind, bring documentation of the system’s technology as well as all certifications from NSF (National Sanitation Foundation) and ANSI. You can find a good overview of the regulations at this link. Septic System That Works on Wetlands? It was a great post and thank you for sharing your knowledge. I’m looking to purchase a land in North Carolina which only provides gas and electric for utilities. The property is a wetland and has no public sewer available. I plan to build a vacation home for my family and eventually my retirement home. And the only option I have is to put private septic tank for sewer. What would you recommend on the type of septic system I should put to a wetland property? Is the Alternative I tried looking for company who does alternative engineered septic system and can’t find any. Will you be able to direct me how to find them. The first question is whether you can or should build on a site that is wet and may be a legally protected wetland. In most places, you cannot get a building permit to build on a wetland. And even if you can, you need an expensive and sophisticated drainage and foundation waterproofing system to keep the home dry and free of ongoing moisture problems. Building an alternative septic system on wetlands is perhaps a greater challenge. A conventional leach field cannot be used with a high water table. In some cases an aerobic treatment system or a recirculating sand filter can produce water that is clean enough to discharge to surface water after disinfectant is added. But getting permission for alternative septic systems requires the cooperation of local authorities, as well as septic designers and installers experienced with this type of system. Also plan on much higher costs to install and maintain such high-performance systems, some of which operate like a mini sewage-treatment plant. Plan on more frequent pumpinp and regular monitoring, often handled throgh a maintenance contract. What types of alternative systems are allowed depends on local regulations and the discretion of local officials. Definitely meet with them (building or health department) to review your options before proceeding. They can also give you the names of licensed septic system designers in your area. Often these are civil or soils engineers. Find someone who has designed successful systems on similar building sites. I would not purchase this type of land without written confirmation from the local authorities that you can build a house and septic system on this property. Make any offer to purchase the land contingent upon the necessary approvals – or you could end up with a unbuildable and virtually worthless piece of land. Best of luck with finding a suitable lot! Septic System Options With Compressed Soil? A soil engineer determined my lot to be unsuitable for a septic system due to soil compaction that occurred over the years caused by poor farming techniques. Most the topsoil has also been eroded from the top of the hill we planned to build on. What are my options if a traditional septic and/or mound have been rejected? •	What will work effectively? •	How much will it cost to install and maintain? •	What will the local authorities permit? There are systems that can deliver water clean enough to discharge to surface water, such as an Aerobic Treatment System, which you can read about at this link. Many of these systems use fan-forced air, in addition to dosing pumps, and some add a disinfectant as the final treatment step before discharging the wastewater. Think of this a mini-wastewater plant, with some of the same maintenance requirements. A recirculating sand filter is a similar system with a few less moving parts (no fan-forced air). Both of these systems are expensive to design and install and require more monitoring and maintenance than a conventional system. There are many design variations and each system needs to be carefully engineered. As a practical matter, the more pumps, fans, and controls, the more there is to go wrong. On rural sites with a large area for disposal, you might want to consider drip irrigation or even a constructed wetland. These are conceptually simpler, but require more active involvement than most people want with their sewage. As for what the local authorities will allow, this varies all over the map. It often takes some negotiation to get permission to install a system that is not widely used in your area. Your best resource is often a local engineer or licensed septic system designer who is familiar with the local regulations and the people who enforce them. They can help you find the most cost-effective solution that will get approved. Thank you. This is very helpful and at the very least, gives me a glimpse of hope. When you say “discharge to surface water” does that mean water discharged into another body of water such as a pond or creek? Or does it hit the surface of land? Around here, in northern Vermont, I know of several aerobic treatment systems (also called aerobic treatment units or ATUs) at lakeside vacation homes. They systems are within, say, 100 feet of a large lake, so the discharge ends up in the lake sooner or later. Depending on the system design and local regulations, these systems may discharge to gravel trenches, be dispersed over a large area with spray nozzles, or discharge directly into a stream or lake after being disinfected – depending on local regulations. Discharge to open water is probably not a great idea in the event that the system is not working 100% as planned. Nitrates may be removed, but harmful bacteria may still be present. Also the discharge from these systems can have a noticeable odor. Good engineering, careful construction, and proper maintenance are critical for success. For more information, view Aerobic Treatment Units, published by the National Environmental Services Center (NEFC). Why Mound Requires Undisturbed Soil? My lot was perc tested in the front part and requires a mound system. I would prefer the system in the back of my lot, but my contractor says it had been disturbed when they developed the subdivision. Why can’t a mound system be on top of “disturbed” ground? Placing the drain field (leach field) on “undisturbed soil” is a standard specification for conventional septic systems and many alternative systems, such as mounds. The assumption is that the soil under and around the drain field will absorb, filter, and provide the final treatment of the effluent as it flows through the gravel trenches of the drain field. The soil must be permeable enough to accept the liquid, but fine enough to filter out the remaining bacteria before the water returns to the aquifer. Soil that has been compacted by traffic, regrading, or filling will generally not perform as well as undisturbed soil that meets the criteria for a drain field, as determined by a perc test and visual classification of the soil in an observation hole. The permeability of the soil as measured by the perc test results determines the size of drain field. In a situation like yours, it is also difficult for authorities to determine what areas are disturbed and which are natural. To make their lives easier, they stick to the undisturbed soil rule. At what point is soil considered “undisturbed” for purposes of placing a drain field? Ten years? Thirty years? One hundred years? That’s really up to the health department of whoever issues the permit for the septic system. Engineers and septic system designers apply a large safety factor in their calculations and don’t like unknowns. On occasion, people try to pass a perc test by adding a thick layer of permeable soil removing and replacing poor soil with more permeable soil – something frowned upon by the local authorities. On the other hand, since your mound system is presumably an engineered system, maybe the engineer can come up with a suitable design that the local authorities will accept. If a mound system won’t work, ask what other alternative systems might be acceptable. Having a site that does not perc can be costly and frustrating, but sometimes the local authorities will work with you to figure out a workable solution.